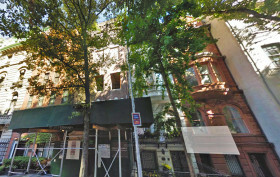 6sqft recently reported that construction had begun on Russia-born billionaire Roman Abramovich‘s Upper East Side megamansion combo of three existing townhouses on East 75th Street. Plans for the megamansion with a pool, art room, backyard and a glass and bronze curtain wall connecting the three townhouses in the rear, designed by Stephen Wang + Associates, were approved by the Landmarks Preservation Commission in November of 2017. The LPC approval came a few months after Abramovich announced a split from arts patron and businesswoman Dasha Zhukova, whom he married in 2008 and with whom he has a son and a daughter. 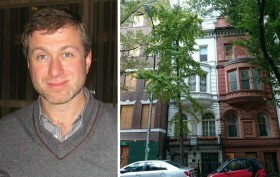 Now, the New York Post reports, Abramovich has transferred ownership of the properties at 9, 11 and 13, along with at least one other Upper East Side address to his ex. Russia-born billionaire Roman Abramovich is moving ahead with his plan to construct a mega-mansion on the Upper East Side, the New York Post reported on Monday. 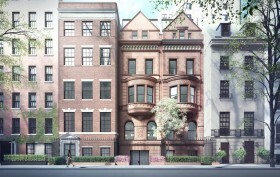 Abramovich’s original proposal in 2016 called for an “18,255-square-foot mansion with a six-foot front yard, 30-foot backyard and pool in the cellar” across a combination of three townhouses on East 75th Street. Although the Landmarks Preservation Commission rejected that first plan, a proposal that kept similarly-styled facades and added a fourth property was approved soon after. In the wake of Mayor de Blasio’s claims that Russian oligarchs “basically stole the wealth of their country with the help of their government” and then used these “ill-gotten gains” to buy up property here in the city, one of the country’s best-known billionaires, steel magnate and owner of the Chelsea Football Club Roman Abramovich, has purchased a fourth townhouse on a landmarked Upper East Side block in order to create an unprecedented mega-mansion. According to the Post, Abramovich’s latest buy was a secret one but brought his total assemblage up to a whopping $96 million. Though he could’ve created the “biggest home the city has ever seen,” reps for architect Stephen Wang tell us that the project will still remain a three-townhouse combination, now with a different trio included. Russian billionaire Roman Abramovich started assembling his $78 million trio of Upper East Side townhouses at 11-15 East 75th Street back in January of 2015, but it wasn’t until this past March that he first released his proposal to combine the townhouses into a giant mansion. The Department of Buildings rejected his initial, $6 million proposal, which called for “an 18,255-square-foot mansion with a six-foot front yard, 30-foot backyard, and pool in the cellar,” as 6sqft previously reported. But since the homes are located within the Upper East Side Historic District, it’s the Landmarks Preservation Commission who has the final say. The LPC also rejected Abramovich‘s first proposal in April, but today they reviewed and approved a revised plan from his architect Steven Wang, along with big-name firm Herzog & de Meuron as design consultant. It calls for a modified restoration of the current facades and the removal of the rear yard building elements to be replaced with a garden and new glass facade that unites the three homes. A little over a year ago, Russian billionaire Roman Abramovich “secretly” purchased two sizable Upper East Side townhouse at 11 East 75th Street and 15 East 75th Street, for $29.7 million and $18.3 million respectively. It was quite obvious that the steel magnate had plans to create his very own makeshift mansion by snatching up the home in between, and this past summer he did just that, dropping $30 million on 13 East 75th Street, which brought the total to $78 million. But now Abramovich may have to alter his grand plans, since the Post reports that the Department of Buildings rejected his $6 million proposal to combine the Queen Anne-style townhouses. Prepared by architect Stephen Wang, the plan called for an 18,255-square-foot mansion with a six-foot front yard, 30-foot backyard, and pool in the cellar.